or: A movie filled with cop funnies. Will Ferrell has always been one of those people who have divided my attention. I used to love him, until I realized that he hasn't really done anything substantial and his shtick isn't really that funny anymore. But his pairings with Adam McKay (Step Brothers, Talladega Nights, Anchorman) have always been funny, and even though The Other Guys isn't as good as those ones, it is still no exception. Throw in some Mark Wahlberg (who you may remember as rap-star 'Marky Mark' from back in the day) poking fun at an arrogant character and this movie has it made. NYPD Detectives Christopher Danson and P.K. Highsmith (Dwayne Johnson and Samuel L. Jackson) are the baddest and most beloved cops in New York City. They don't get tattoos - other men get tattoos of them. 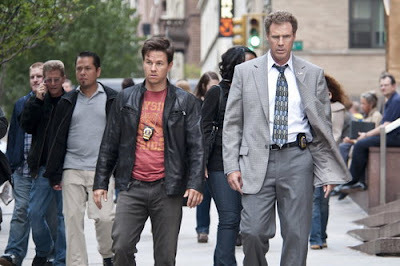 Two desks over and one back, sit Detectives Allen Gamble (Will Ferrell) and Terry Hoitz (Mark Wahlberg). You've seen them in the background of photos of Danson and Highsmith, out of focus and eyes closed. They're not heroes - they're "the Other Guys." But every cop has his or her day and soon Gamble and Hoitz stumble into a seemingly innocuous case no other detective wants to touch that could turn into New York City's biggest crime. It's the opportunity of their lives, but do these guys have the right stuff? Putting Will Ferrell and Mark Wahlberg together in the long list of 'buddy cops' in these types of movies is weird, but the mismatched duo really work. Sure, Wahlberg may have been a little too arrogant, but this is no match for his Oscar-nominated turn as the super arrogant Dignam in The Departed. Ferrell is just very same-same, which should be a shame. If you're used to Ferrell's typical antics, then chances are you will probably love this film. Even though they disappear early in the film, Dwayne Johnson and Samuel L. Jackson remain a high point in the movie, as they also poke fun at the 'tough cop' stereotype. Essentially, this is a movie which has no problem in making fun of the cop stereotype the film industry has built up over the years. The story of the movie is a little dry, but the laughs within the script come thick and fast. It's be ages since a comedy has actually been funny. The Other Guys fills the gap of a time largely devoid of laughs quite well, and all in all, it is a pretty funny movie. Typically funny, but there are lot of fresh laughs to be had. Especially when Mark Wahlberg shows off his 'ballet talents' to his girlfriend. If it's a laugh you're after, then look no further than The Other Guys. They're actually quite funny. THE VERDICT: The Other Guys is the kind of movie that is the normal comedy we see these days, but is made all the better by the mismatched partnership of Will Ferrell and Mark Wahlberg. Wahlberg is flat-out hilarious, playing the goofy, straight guy, and proves that he can actually have a great sense of humor. 2010 was definitely the true year of Mark Wahhlberg with this The Fighter, and even Date Night, it proved to be a pretty successful year for Marky Mark. Mark Wahlberg sure has come a long way since being a rapstar! He has had a big year, and we must not forget, he produced The Fighter too!